Limited edition SDCC Exclusive color variant! 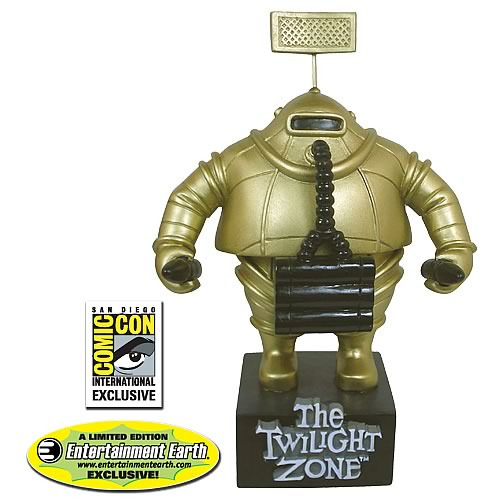 Bobble head of the Invader from Rod Serling's The Twilight Zone. Limited to just 504 pieces! This Bif Bang Pow! wobbler is available only from Entertainment Earth. Entertainment Earth Comic-Con San Diego 2010 Exclusive! Standing about 7-inches tall, this eye-catching, authentically detailed, color statue is based on the memorable "The Invaders" episode of The Twilight Zone that starred Agnes Moorhead. It's a limited edition of just 504 pieces that's available only from Entertainment Earth. Answer its beckoning call by ordering this one-of-a-kind collectible today! Limited edition of just 504 pieces. Note: This item is a bobble head; it is not a full-size replica of an Invader.